Come join us May 18th from 6-8 pm. We are showcasing two artists from 4th Street Fine Art. I grew up moving city to city, state to state and finally country to country. I have learned new accents, new languages, new cities and new friends every few years. I am home everywhere and nowhere. In this exhibition I explore themes of political freedom in art. In this painting "Da Worm and Nuke Kid on the Block" I take a critical eye at Dennis Rodman's infamous trip to North Korea to try to defuse the military situation from going to full-scale war. At the same time it shows how the star and US government have tarnished their reputation with the state famines of the country doing media photos with the dear Leader. Don Clausen got his start back in the 1960s painting after his stay in the US marines. He is originally from Oakland and has been painting ever since. He helped organize the artists of Berkeley to sell off the street in huge art sales on Telegraphy. He then moved to a gallery on Telegraph, where he painted and sold from for many years. Originally, he started in realism in the California College of Arts and Crafts and slowly moved into more abstract painting. 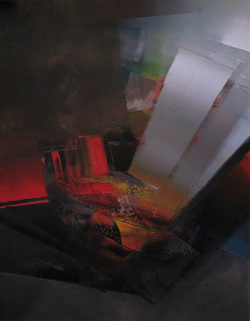 Some say his technique is similar to Gehardt Richter, who is also painting in his 80s. Alta Gerria was his representative. 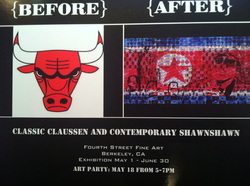 This is her second major show of Claussen's work. Her last show was in 2009.